JUPITER, Fla. — Hey everyone, it’s been quite a while since I wrote my last blog. Thankfully, I have been beyond busy with racing and I’ve now found a few moments to catch up! After arriving back to the States from England I had gotten a lot of word that “NOW comes the hard part,” and everyone was right. 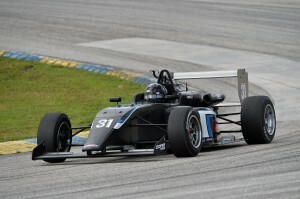 There were a few options that I had for the 2017 season and the two that were the obvious stand-outs were the Formula 4 United States Championship Powered by Honda and the Cooper Tires USF2000 Championship Powered by Mazda. 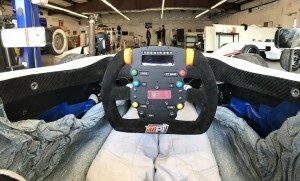 If I had won the Mazda Road To Indy USF2000 200k Scholarship Shootout last fall it would have been a very easy decision, but since I didn’t it was very tough picking one… I did two tests in both cars; in F4 I ran both tests with Cape Motorsports at Nola Motorsports Park, just outside of New Orleans, and at Atlanta Motorsports Park, near Dawsonville, Ga. Then in USF2000 I tested once with the Capes at Barber Motorsports Park and once with Benik at Homestead-Miami. After those tests, I leaned toward F4 knowing it would be my second year with more experience than most of the other drivers in the series. This decision was very tough and took me until the very last minute to make up my mind. 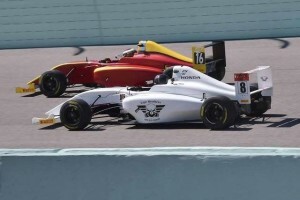 Unfortunately, I unknowingly broke an F4 rule by testing the USF2000 car at Homestead, which brought me 10-place grid spot penalties for each of the first three races in F4. At the time, I had no idea and the rule wasn’t very clear, but it’s racing and sometimes you just have to bite the bullet. Coming into the first round this past weekend, the best we could start for any of the races would be 11th. We were very fast – every practice session we were in the top five without a draft, which was worth as much as a second per lap — and I managed to qualify second, within a tenth of the pole, which should have placed me 12th for the first race. However, 30 minutes prior to the race I received another 10-place penalty for contact with a new driver who was on cold tires in qualifying. This meant before even the first race I already had a total of 40 positions of penalties! After starting in 22nd for Race One, we made up a handful of positions on the first lap, only to find that our engine had some kind of mechanical problem and overheated much higher than a safe level. We were forced to retire early. The mechanical issue is still unknown and Honda has taken the engine to investigate the issue. That day wasn’t the best to say the least… Because of the issue, we were unable to run a decent lap so that meant we would start from all the way in the back for Race Two on Sunday. It made me a little nervous knowing we had a brand new engine; it was really a guessing game and we were unsure if the engine would be any good, or if the engine would run at all. We started 33rd for Race Two, and by lap three I was already in 14th! We were on a roll. Unfortunately, there were many cautions and the field only ran eight green-flag laps. Across the line we finished eighth with the fastest lap by over a half-second. 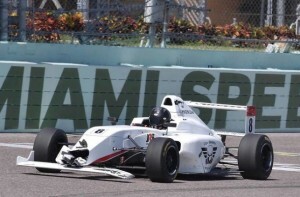 Immediately, I had tons of confidence in the car, engine and the team. Race Three wasn’t exactly straightforward…. Race Three came around and our 10th-place starting position (due to yet another penalty, of course!) would put us in a good spot to be capable of winning the race. I was already up to eighth by Turn Six on the first lap. Unfortunately, my streak was dampened by another competitor overshooting Turn Eight and clipping my rear left tire just enough to spin me in front of the whole field. It is all kind of a blur to me but someone did run over my nose/wing and we had to make a pit stop to change it under caution, so once again we were at the back of the line! From 23rd, I managed to fight all the way back to sixth, only to have the same thing happen again in Turn Two on the last lap. I fell back to 12th and finally came across the line to finish 10th. Although the results weren’t the best, we definitely showed great speed…and everyone noticed. Now that we’ve gotten through the mess with the penalties, I know Indianapolis in June will be a very different story. I’m excited! Thank you all for reading and I will keep you informed!